I’ve been dying to try Rosso, Momo’s AND Saluda’s! But I’ll any (mostly) anywhere that I have a gift card to! (Case in point… Ruby Tuesday’s, which I have a giftcard to and will use soon!). Thanks April! Good luck to you! Twitter! And email subscriber… I don’t have Facebook do you have to do them all? Better start emailing! Jess, thanks for entering! If you forward the giveaway to 5 friends (and copy us on it: capitalcityeatz@gmail.com), that will work! Thanks again! Good luck! Awesome giveaway, y’all! I’ve been dying to get back to Rosso, so I’m hoping I can win that one Also note that I subscribed to the email list with my personal email instead of the blog email, just so I can be sure I don’t miss anything. Laura, we appreciate your participation in our giveaway! We figured everyone would like the gift cards . Thank you for your kind words! Just found your site and I am excited for what you have in store. Following on Twitter, Instagram and Facebook. I am following you on facebook, signed up thru email and shared your post about the card giveaway!! Rosso….favorite restaurant in Columbia!! Who doesn’t like hearing about the best places to eat in Columbia?! My favorite part about capital city eatz is ya’lls intagram page. I’m obsessed with looking at pictures. I’m even more obsessed with food. Obviously this means i’m obsessed with ya’ll. Thanks for keeping me in the know! Thanks Allison! We appreciate your obsession Glad you like our pics! I’ve signed up for the email, followed you on twitter, and liked you on Facebook!! Love the website! Thank you! We appreciate your support! Good luck! Never been to this site before. Looks good. My comment? Would be better with some better design/graphics. Suzanna, we appreciate your comment. We are sorry you do not like our design or graphics, though I can’t say we agree! Thanks for sharing your opinion. Love the local food in Columbia! Would enjoy trying Rosso for the first time! Y’all should post about great places to dine for the upcoming graduation festivities (aaaahhhh) ! I’ve been struggling to come up with family appropriate and not too pricey places — would love some input! Thanks so much for the comment and kind words Lauren! That’s a great idea, we will certainly look into writing a post about graduation places! I love that you guys post reviews about the restaurants in Columbia! It is so great to be able to see what Columbia has to offer, especially when friends come into town and you don’t know where to eat! Follow us on Instagram (@capitalcityeatz). I also love all of those restaurants. the head chefs are all super awesome people and their food is delicious. This giveaway is such a great idea. Brittany, thank you for your comment! We are glad you like our site! We love the restaurants too, we have a lot of fun reviewing! Thanks again. Was unaware of this website until the gift-card giveaway. Such a foodie and Columbia has so many hidden gems! Patrick, glad our marketing efforts to get foodies like you to our site worked! Be sure to spread to your other foodie friends! Thanks for your comment! Just found te blog and love it. Thanks for this contest. Just moved back to Columbia after a decade of moving around with my Army hubby. Excited to be retired back here. Looking forward to reading more from y’all (and hope I win a card!). Welcome back! And thanks to your husband for his service. Good luck! Thanks Truitt! Glad you like! First of all i moved here from way up in the great white north about three years ago and found you guys via the free-times about two months ago and I’m now obsessed with Rosso and Cantina 76. Shannon, what wonderful comments! We are so glad you like our reviews and that you entered our giveaway! Best of luck! Love the site. I’ve enjoyed following y’all on twitter for a while now. Thanks for a great contest. I hope you’ll have more in the future. Heard about the giveaway through the Hungry Lady ! Would love the opportunity to continue to support local restaurants! Great! We love local restaurants too! Thanks for the comment! Lovin the info on the fabulous eats in the area!! Always interested in checking new flavor in Columbia!! Thanks for keeping us in the know!!! This site makes me love Columbia all the more! Its really helpful in learning about great eatz too! I love your reviews! So funny! Keep up the great work guys! Thank you for your enthusiastic comments. Please share with USC students! Love the reviews! Imac is my favorite- hilarious. I followed on email and facebook. keep it up guys! Twitter and subscriber! Love the whole idea of this, I have so many Cola restaurants I’ve yet to try! Thanks Meredith, Columbia SC is lucky to have some great local restaurants. We hope this site helps you find some good eats! Great to find one place to check out great local places – so much better than those chain restaurants…. Thanks! Thanks for the comment! You missed this giveaway, but stay tuned….there will be more free food up for grabs in the future. Great giveaway!! Rossi is the best but I would be thrilled to try the others too! 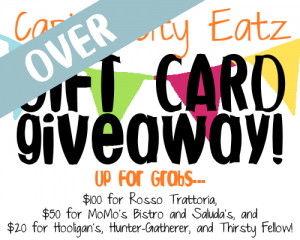 Thanks Capital City Eats for a great contest! Thanks! Sorry you missed it! We announced the winners last Friday. We will be having another one soon though!